Andy Carter, Sonex SN#1109 was featured in the September, 2010 issue of LAA Light Aviation magazine in the UK. Andy is the builder of the first customer-completed Sonex Aircraft to fly in the United Kingdom since Sonex dealer Silver Fern Microlights obtained LAA approval allowing Sonex projects to be built in the UK. 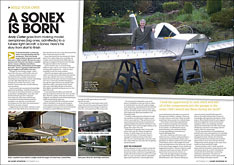 The four page feature article “A Sonex is Born” (download 1.5mb PDF file), documents Andy’s enthusiastic journey from RC aircraft construction and flying, through flight training and the construction of his AeroVee powered Sonex, which first flew in 2009.